Eastern Geek: Replicating Criss Angel's Matrix Muscle Suspension / Levitation. Learn how to replicate one of Criss Angel's most famous illusion / magic trick, the Matrix /Muscle Levitation (aka Muscle / Matrix Suspension). In particular, the illusion he did at a park, where he leaned backward with just one leg on the ground. He's suspended as though by magic. First of all, I'm not out to debunk anything. I'm just hoping to replicate the illusion (at least theoretically). So, this is more of a how I would do it, rather than how Criss Angel did it. 1) First, lets get the basics out of the way. Supported / repelled from bottom. As for this particular illusion, it can be viewed as an basic lever system at work. Which is shown in the simplified diagram below. From the diagram, the body weight will be subjected to the force of gravity pulling it downward. The heel is acting as the fulcrum. In order to keep the system balanced, a downward force need to be applied on the other side of the lever, in a form of a counter weight. The human body is not rigid. We have joints that permit certain degree (range of) movements. I'm not an Olympic gymnast, therefore even with the counter weight on my foot, there is no way I'm strong enough to hold my entire body in that position. Considering also the extreme stress it will put on my muscles and joints. The diagram below highlighted my problems (in red). Rightfully, I will need some kind of contraption to alleviate the stress off my muscles, and provide additional support for my body weight. I will also need to limit the bending of my knee. Getting the idea from the design of medieval knights armor, but with a different twist, I will be needing a custom rigged leg braces. I've highlighted the key part in the rig. The braces will help me with 3 things. Limit the bending of my knee so it won't go more than 90 degrees. Support my hip, thigh so that I can rest some of my body weight on just the braces. Padded against my calf and provide the counter leverage. Worn underneath a baggy jeans, the braces will be completely inconspicuous. Of course that alone won't be enough, I will still need to provide support and limit the bending of my ankle. So I will need a custom boot / shoe, attached to the above braces. The boot / shoe will have a metal spine running through it's sole. I will need some amount of free play at the braces-spine joint (as highlighted) in order for me to walk. Tying the laces tightly will add additional support. The metal toe-cap has it's use which will be shown later. For the anchor, a long nail, with a cement filled milk can would work. The nail only needs to protrude by just a few millimeters above ground. The grass will help keep the protruding nail hidden. Locating the anchor will be trickier in a wide open area, so I will need to memorize the ground features and use them as visual markers. I can then pinpoint the nail by feeling it with my feet, the trick is by gently stepping and dragging around the area. This is the hardest part. It will need great balance and strong muscles, particularly the abs. And above all, some great acting skills. Leaning backward is very tricky, especially doing so while trying to keep my balance. Thus, I will need someone to hold my hand and lower me. Once I get into the suspended position, my braces will start to do it's job of supporting some of my weight while keeping my leg at 90 degree. The upper portion of my body weight will be supported by my abs. My custom boot anchored to the ground will provide my counter weight. The toe-cap will help provide additional leverage from within the boot. Once I've stabilized myself, I can start to lift my other leg, slowly while keeping my balance. Of course I can't hold myself in the suspended position for very long, it will be too tiring. Thus I can only be in that position for a few seconds, enough to be convincing. As for Criss Angel, he is also good at misdirecting. If you've seen the whole trick on TV, there is an instance where the camera zooms to his legs. He's showing that theres nothing on the ground underneath his legs, next to his left foot is something that looks like a small pile of dirt. As the camera zooms out, we can see there's a dead tree and in the backdrop, with a motor-home in the parking lot. However when he's about to perform his trick, magically the pile of dirt disappear from next to his legs, no dead tree in the backdrop, no motor-home in the camera frame. That's a misdirection. He actually moved to a spot a few meters from where he previously stood, where (I presumed) the anchor was buried. The good thing about not having to perform live, you can have cut scenes. If any of you ever try this trick, be sure to share the video! thanks a lot Mr Chein, you did a good job! It's really helpful I'll try to build it then I'll post a video! good job with this, you really did think hard. But how do you explain Cyril takayama doing his matrix levetation in the street on concrete and on t.v shows with wooden floors? Jack: Pretty much the same way, with a protruding nail/screw on the floor. cyrils version is the same but on concrete. but the gimmick is just the same. the leg brace and the rod in the floor. He's still wearing a leg brace of some kind. Watch the knee of the leg he keeps planted on the ground - it doesn't waver at ALL, literally no movement as he is leaning back, etc. Something is holding it securely anchored to the sand. He is probably wearing a brace minus the boot that "joins" with the anchor just behind his heel. Which explains why he's the only one in jeans on a hot beach. Watch how awkwardly he moves at the end of the clip as he reaches out towards his audience - from the knee down, he's still affixed to his anchor - no movement. do you think you need a back brace, too? I would absolutely love to be able to buy custom shoes and things like that. Any takers in making a pair for an icelandic magician and selling it? Hi there, Is it possible to do it without a buried anchor and do it on stage? Good right up, but has anyone had any success? I believe some magicians have been doing this with leg weights instead of an anchor point. Physio leg supports can lock so they don't allow the knee to go beyond a 90 degree position. Anyone tried a set of these instead of custom making a brace? Good theory and write up, anyone have any success? It looks to me like it could be done with leg weight + brace instead of anchor + brace...it certainly looks like some magicians are doing it this way. 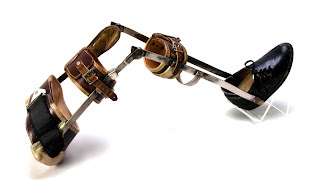 With regards to leg braces, post knee op patients have a full leg brace with the ability to lock and restrict movement to a desired position (ie 90 degrees). They look well made and strong, has anyone tried this instead of a custom brace? They are around 150-200USD. I was wondering where would I buy a kit to do this levitation trick?